Myanmar has issued national verification cards to the seven men deported by India on October 4, which can only get them citizenship if a 1982 law is amended. 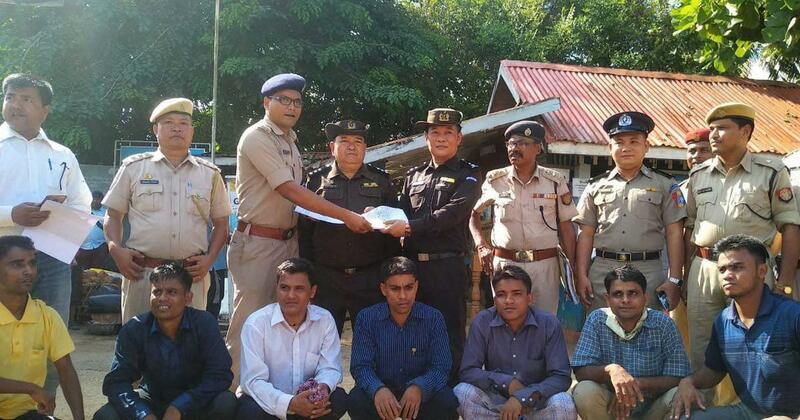 Assam Police hand over the seven men to Myanmar authorities at Moreh border post in Manipur. 2 Nov 2018 – On October 4, India deported seven Rohingya men from a detention centre in Assam to their home country of Myanmar, from where they had fled around six years ago. This was the first official deportation of Rohingyas from India. The Supreme Court refused to interfere in the matter after it was convinced by the Centre that Myanmar had accepted the refugees as citizens and had agreed to take them back. The Rohingya are an ethnic Muslim minority community from Myanmar’s Rakhine state who have faced persecution in the predominantly Buddhist nation for around four decades now. “They [the seven deported Rohingyas] were found to be illegal immigrants and their country of origin, Myanmar, has recognised them as Myanmar citizens,” Chief Justice of India Ranjan Gogoi had said on October 4 while refusing to grant an urgent hearing to a plea to stop their deportation. However, documents seen by Scroll.in show that these men have not been recognised as citizens by Myanmar. The Burmese government has issued them with national verification cards – a document that its government describes as the first step towards applying for citizenship. But these cards will not bring the refugees citizenship as the Rohingya community is not listed as a “national race” in the country’s Citizenship Act. Under this 1982 law, being listed as a “national race” is a pre-condition for citizenship. This raises more concerns as the Indian government is reportedly preparing to deport 23 more Rohingya Muslims who are being held at detention centres at Silchar, Goalpara and Tezpur in Assam. The Myanmarese government issued the deported Rohingya men with national verification cards around 10 days after they reached the country. 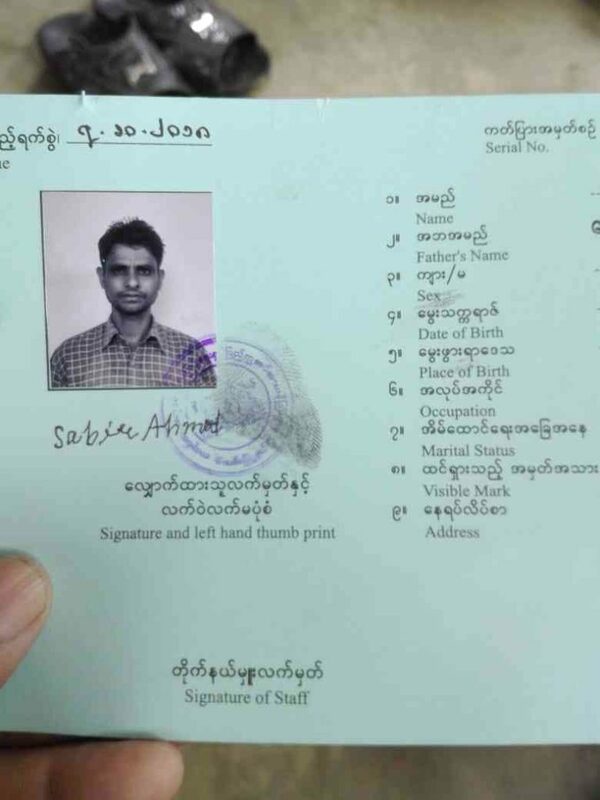 The cards state: “This identity card holder is a person who need[s] to apply for citizenship in accordance with Myanmar citizenship law.” According to the government, the cards mark the “first step before the scrutinisation of citizenship, in accordance with the 1982 Citizenship Law”. A Myanmarese nationality verification card. In June, Reuters reported that Myanmar had told Western diplomats that it could not implement a proposal to review its citizenship law put forward by the Kofi Annan Commission because of the political climate in the country. 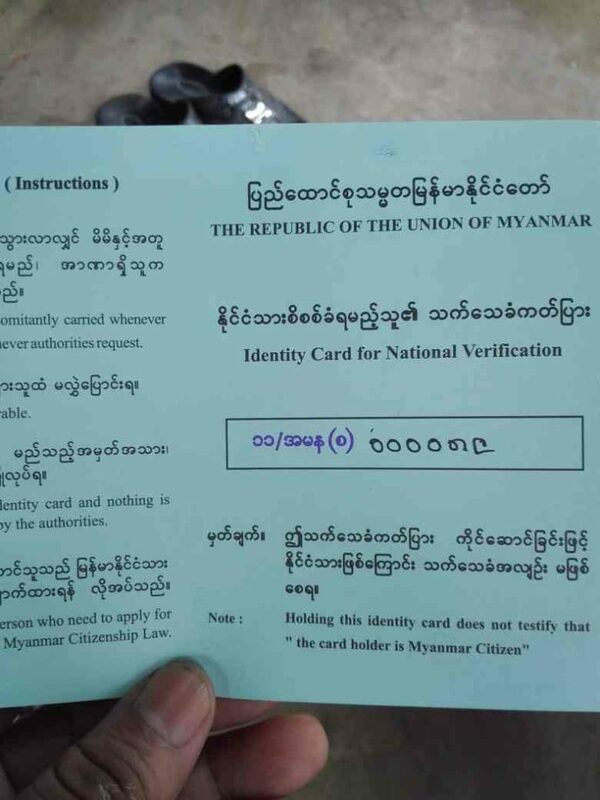 Myanmar started issuing national verification cards in 2015, according to the United Nations High Commissioner for Human Rights. By October 25, 2017, the Myanmar government was claiming it had issued more than 7,000 national verification cards. But reports had started to surface that the Rohingyas living in Myanmar were being pressurised into accepting these cards. One of the seven deported Rohingyas said on coming back to Myanmar he was not even given a chance to decline the card. The national verification card does not give Rohingya any political or land-owning rights in Myanmar. Till April, holders of the national verification cards were restricted from travelling within the country. National verification card issued to one of the seven deported Rohingyas. The seven deported persons were identified as Mohammad Jamal, Mukbul Khan, Jamal Hussain, Mohammad Inus, Sabir Ahmed, Mohammad Rahimuddin and Mohammad Salaam. One of them said that on October 3, the Assam Police had taken them in a bus from Guwahati in Assam to Imphal in Manipur. The next day, they were taken to the border town of Moreh, where they were handed over to immigration officials in Myanmar. A group of officers then accompanied them to Yangon, the old capital of Myanmar, where they stopped overnight. The next day, a smaller group of officials accompanied them to their villages near Choktow, which took them two days to reach. The officials left after completing some paperwork in connection with their nationality verification cards. They now live in their villages with their relatives. The seven men had fled Myanmar in 2012 during sectarian violence in Rakhine during which Buddhist groups killed hundreds of Rohingya Muslims and set ablaze several villages in Sittwe. They came to India through Bangladesh, one of them said. When they were in India, several thousand Rohingya Muslims fled atrocities in Myanmar, in 2016 and 2017, and sought refuge in neighbouring Bangladesh. An official with an intelligence agency in India said that the citizenship verification process of the deported Rohingya refugees was unprecedented. He said that in previous cases – such as those concerning undocumented immigrants from Bangladesh – India verified the nationality of the immigrants before it deported them, not after. Government records show that between 2013 and 2017, India deported more than 7,000 undocumented Bangladeshi immigrants. The Indian government has said that the travel documents required to enable deportations of undocuments immigrants are issued by the relevant foreign embassies only after the nationality of the person to be deported was verified. Senior officials at the Union Home Ministry could not say why the same protocol was not followed during the deportation of the seven Rohingya men earlier this year. While thousands of Rohingya Muslims have settled in India over the last four decades, more than a million Rohingya refugees have taken shelter in Bangladesh in the same period. Several thousand more Rohingya are estimated to have fled their homes, especially after Myanmar launched a fresh military crackdown in Rakhine in 2017, claiming that it was fighting extremist groups. At that time too, Bangladesh was their main destination. Some have suggested that Myanmar may be helping India and Bangladesh develop some sort of a repatriation scheme by permitting them to deport Rohingya in smaller groups. The first pact for the repatriation of Rohingya refugees was signed between Myanmar and Bangladesh in November 2017. Officials in the Union Ministry of Home Affairs said India and Myanmar had signed no formal repatriation pact but the two countries have discussed the matter on multiple occasions in the past two years. India has not signed a specific repatriation treaty with Bangladesh either, but it has still deported undocumented Bangladeshi immigrants, mostly from West Bengal and Assam, said the officials. The buzz about the deportation of Rohingya refugees from India started in August 2017 when Minister of State for Home Affairs Kiren Rijiju said that Rohingya Muslim refugees living in India were undocumented immigrants and would be deported. Human right activists and lawyers have often pointed out that such deportations cannot take place without violating customary international laws. When India drew criticism from the international community for this, Rijiju backtracked a month later, saying that states had only been asked to identify undocumented immigrants, and so far India had no definite plans to deport Rohingya refugees. Around a year later, in September 2018, the Centre directed states to obtain the personal data of Rohingya Muslims for deportation. Scroll.in has a copy of the form that has been distributed among Rohingya refugees in India for the purpose of gathering data. It asks for information such as name, gender, date of birth, place of birth, address, occupation, religion, nationality verification card number (if any), parents’ religion and nationality, their occupation, their address and “special peculiarities”. The forms left some refugees running from pillar to post in police stations, seeking help to fill them up. Several others have left the refugee camps they have been living in, fearing that they will be forced to fill them up. They believe that the forms will be used to eventually facilitate their deportation. It is not just about citizenship. The deportation question raises more concerns – about life and security for instance – especially as United Nations investigators said on October 24 that genocide is still taking place against Rohingya Muslims in Myanmar.